A collaborative tattoo designed by Pat Fish and installed on esteemed colleague Colin Dale won First Prize for Best Ornamental Tattoo at the STOCKHOLM INK BASH 2008. More recently, this unique piece was awarded Best Use of Tribal at the NATIONAL TATTOO ASSOCIATION 2010 CONVENTION. 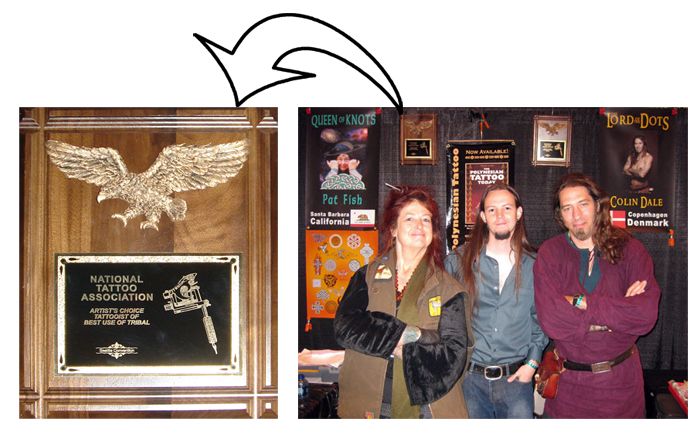 Colin continues to enter it in contests as he attends conventions around the world, and he and the tattoo are still racking up awards! Scroll to the bottom of this page to see a few more of them. The tattoo was the culmination of a project started on Colin's leg in California, when he was flown out to take part in the filming of the ANCIENT INK TV documentary, showcasing his Inuit style technique. The tattoo that was to cover his leg ultimately involved various artists in the process, and became an international sensation. The original idea was to design a piece of celtic knotwork which wrapped in an unbroken piece around the entire leg... not just a band, but also running from top to bottom in a three dimensional tattoo encompassing the entire calf. The design came from Pat Fish, who is known as The Queen of Celtic, and is a master at knotwork. She suggested a particular knotwork pattern that culminated in a central star, a nod to the Nordic snow and as a change from the majority of Celtic patterns which form a cross. The design was then given to her Graphic Design Assistant and Webmaster, Colin Fraser Purcell, who used Photoshop and a Mac to customize a template that could be wrapped around the leg in a cone shape. Pat then applied the design - and got it right the first time - Not an easy task, even for someone as experienced as she is. Pat then spent three hours adjusting and freehand drawing it to fit before she even started to tattoo. The pattern was sized to fit the leg, but had to be laced up the back to make the perfect custom fit. Then the original outlining ran into the early hours of the morning. Colin Dale returned home and began to thicken up all the lines himself. This was actually more painful on the hip joint and lower back than the actual tattoo... imagine tattooing while touching your own toes for two hours at a time :-) This was followed by Colin dot shading all the negative spaces on the instep and shin. Unfortunately the tattoo wasn't finished in time to exhibit at the Northern Ink Xposure convention in Toronto; but while there, Colin took the opportunity to have Cory Ferguson fill in the negative spaces in the left side and back where he couldn't reach. Cory is another talented award winning artist and friend who specializes in the pointillism technique combined with mandalas and tribal patterns. 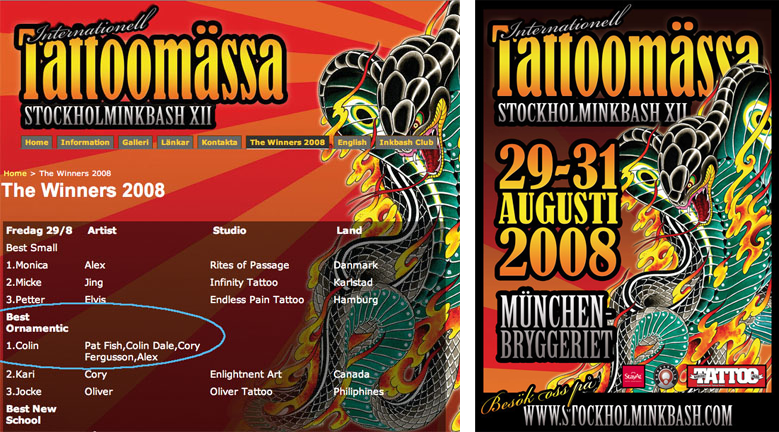 Cory incidentally also won second prize in the same catagory at the Stockholm Ink Bash. After this was completed, Colin took it down to Alex at Rites of Passage, who did all of the greyshading of the knotwork. Alex specializes in Black&Grey and Portraiture, so this was sort of like asking da Vinci to paint a ceiling... with a roller. But it was decided that a simpler more graphic approach was the best way to compliment the Celtic style and complete Pat's original vision. Thanks to everyone who gave their contribution to this great project, and good fortune for Colin Dale who gets to wear the result proudly! If you are interested in wearing a custom piece of art like this, you should contact us to make an appointment! You can also visit the Celtic Sleeves, Tattoo Armor, and Full Knotwork Coverage Tattoos Page to learn more about how tattoos like this are created. If you are unable to visit Santa Barbara, but would like to purchase the line art (flash) for something similar, visit the LuckyFish Art Store.